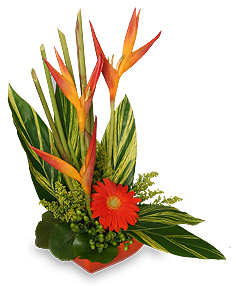 Dracaena leaves, dark orange gerbera green hypericum, 'Golden Opal' heliconias and solidago mastered in container. Container style is based on availability. Enter a message to send along with this gift. Dracaena leaves, dark orange gerbera green hypericum, ‘Golden Opal’ heliconias and solidago mastered in container. Container style is based on availability.